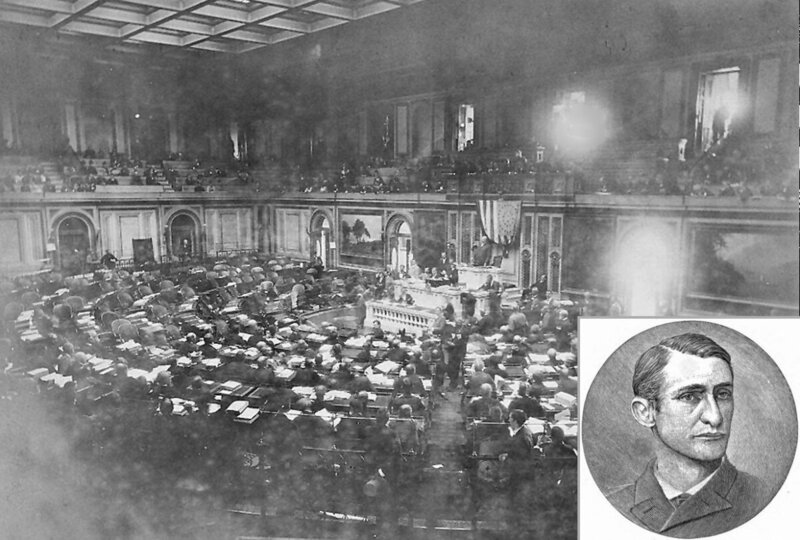 William P. Taulbee, U. S. Representative From Magoffin County, Kentucky, Was Shot By Correspondent In Washington, D. C.
Author’s Note: If one takes a tour of the U. S. Capitol today, the experienced guide will not point out the curious bloodstains in the marble on the east steps which lead from the first floor House of Representatives Restaurant up to the second and principal floor of the House Chamber. Although the architect and the historian of the Capitol are familiar with the story behind these stains, many tourists leave the Capitol without knowing anything about one of the most lively events in the Capitol’s history. Occasionally, the Louisville Courier-Journal will print an account of the incident and on February 25, 1962, the New York Herald Tribune wrote of the “Blood in Halls of Congress There To Stay.” However, no 20th century account is complete, and many are grossly inaccurate. This article hopes to make up for this neglect by giving a comprehensive account of the killing which took place there, the reasons for it, and the aftermath of the crime. William Preston Taulbee (shown in inset photo), of Magoffin County, Kentucky, made quite a stir when a member of the 49th and 50th U. S. Congresses. He had an immensely powerful voice, and in the hours of confusion, incident to heated debate, his demand for recognition could always be heard above the general din, and his tall form and swinging arms supplemented effectively the volume of his voice. Taulbee served from March 3, 1885, to March 4, 1889. He was not a candidate for renomination. This photo is from a 1890 session of the U. S. Congress. On the dark, rainy afternoon of February 28, 1890, reporter Charles Kincaid shot ex-Congressman William Preston Taulbee in the face from a point blank range, as Taulbee was descending the stairs which lead from the Chamber of the House of Representatives to the first floor. As Taulbee lurched and stumbled down the remaining steps to the first floor, the warm blood, issuing from his wound, was rapidly assimilated as it splattered onto the cold, porous marble steps. Eleven days later, the victim died after a helpless struggle. On March 12, 1890, The Louisville Commercial noted that “the tragedy is one that will not soon be forgotten by habituees of the Capitol. It is the first time in the history of that magnificent edifice that an assault resulting in homicide has occurred within its marble and storied walls. Let us hope that it will be the last.” Happily, the shooting remains unique. Accounts of the bitter feud between these two men before the disaster vary with nearly every available point of view. Kincaid had written a story, accusing Taulbee of misconduct with a woman in a government office. The Washington papers “broke” the story and referred to the expose as “The Patent Office Scandal.” Shortly thereafter, Kincaid wrote two more definitive articles for the New York Morning-Journal and The Louisville Times. These stories appeared on December 11, 1887, and on December 12, 1887, respectively. The journalist was a renowned gossip and wrote a “cracker on the tail of each paragraph” of these provocative stories. One, entitled “Kisses For Luncheon,” vividly described Taulbee’s noonday visitations to the Patent Office where he secreted himself with a pretty 18-year-old who was “as bright as a sunbeam” and bestowed upon her the most intimate affections. The two were discovered one day by an employee at their “trysting” place. Since Taulbee was a Congressman and married, the gossip spread and became the talk of the Capitol. The young woman lived on Capitol Hill at that time (1887) only-three blocks from the Congressman and continued to live there after his death, unmarried, until 1900. After the article appeared, Kincaid said that Taulbee rejected his offer of three columns for an explanation or denial. He also insisted Taulbee bullied him mercilessly and at every opportunity. Kincaid had obtained a patronage position in Congress, which he hired a black to fill at a nominal rate. Taulbee aggravated the feud by helping to pass a resolution preventing this kind of activity. Rumors also abounded that Kincaid wrote the defamatory articles in collusion with another Kentucky Representative who wanted the Senatorial seat that Taulbee was planning to seek after completing his term in the House. Blatant enmity between the Congressman and the correspondent continued. While Kincaid lashed out at Taulbee through journalistic invective, Taulbee blasphemed Kincaid orally and publicly intimidated him by sneaking up behind and towering over the smaller journalist or by stepping heavily on his foot in a crowded elevator. It is said the dark stains on the steps of the southeastern stairway are from Taulbeeʼs blood which dripped from the wound. After the publication of the suggestive articles, it does appear that Taulbee took the initiative, forcing Kincaid to lead an apprehensive life for over two years. His attacks on the Congressman via the press, however, did not abate. Some interested parties conjectured that the Taulbee threat was exaggerated by persons who wished to see the sickly correspondent squirm. Taulbee never made an official statement after he was shot, but carried his view of the incident to the grave, perhaps intentionally. An account of the plaintiff’s side of the story was penned by Dr. J. Breckenridge Taulbee from his brother’s hospital room, but its credibility was jeopardized at the resulting trial by the accounts given by Kincaid and by other defense witnesses. Moreover, the jury was instructed to weigh all the circumstances under which the (deathbed) declarations were made and to give to such declarations only such credit as upon the whole they may think it deserves. Although the 1500-page transcript of the trial has been destroyed, a deposition taken from Sanford G. W. Morrison, who could not attend the trial, is extant and includes a notarized exhibit describing the altercation which took place at 12:15 p.m., about one hour and 15 minutes before the shooting. At that time the two men encountered one another at the ladies’ (east) entrance to the House Chamber. Taulbee approached Kincaid and said, “I want to see you.” In a brief ….